The custard apple tree, or Anna reticulate L., is a deciduous fruit tree that is native to the West Indies and was brought to Central America and southern Mexico. It grows regularly in the Bahamas and southern Florida. It was also introduced into tropical Africa in the 17th century. It has many names, depending on the region, but all have to do with its physical appearance. It is referred to in the United States as the sugar tree. The custard tree is upright with a curved or spreading trunk 10 to 14 inches thick. It can grow from 15 to 35 feet tall and is not considered an attractive tree. The leaves are a pale green and start out hairy but smooth out with maturity. They are thin and oblong, about 4 to 8 inches, and considered by some to smell bad. The tree flowers in clusters that are light green on the outside and light yellow with red or purple spots on the inside base. 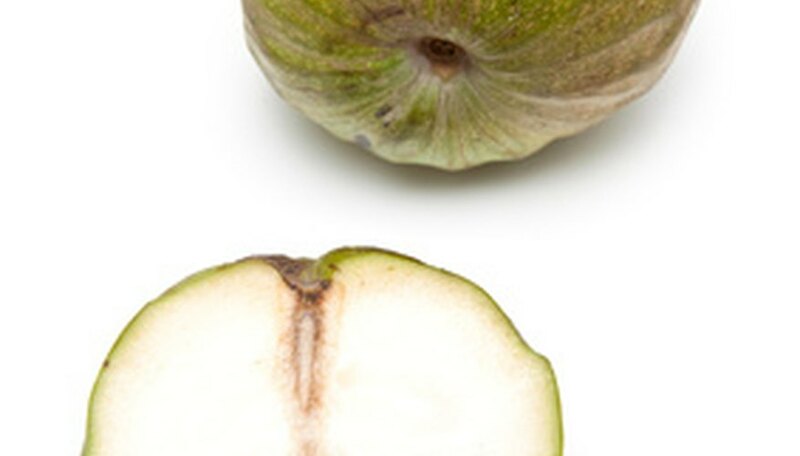 The fruit is odd shaped, with an indent at the base that can be either deep or shallow. The skin is yellow to brown when ripe. The fruit has many small, dark brown seeds embedded in the pulp. The custard tree grows best in temperatures of 73 to 94 degrees F, in high humidity especially during flowering, and in moist soil. They are drought tolerant, but the trees grow smaller and shed leaves in dry climates. They do not do well in cold climates. Newer trees are easily damaged in temperatures of 30 degrees F or below. More mature trees can handle short periods of cold temperatures but will not survive temperatures of 28 degrees F or below. When the fruit is ripe, it can be easily picked at the stem. The fleshy part can be removed from the skin and eaten in a variety of ways. They can be added to milk shakes, ice cream or custards and can be used in cakes and puddings. Some parts of the tree have medicinal uses. The crushed leaves can be made into a paste for application on boils, blisters or ulcers. The unripe fruit contains tannin, which are yellowish or light brown masses that are used as astringents in medicines for things like diarrhea or dysentery. Although the fruit is edible, parts of the custard tree are toxic. The seeds are very hard and if swallowed whole would have no negative effects. However, the seeds, leaves and young fruits can act as insecticides to some pests; the leaf juice kills lice. If branches are cut and sap accidentally sprays into the eyes, it can cause irritation and may seriously injure the eye.